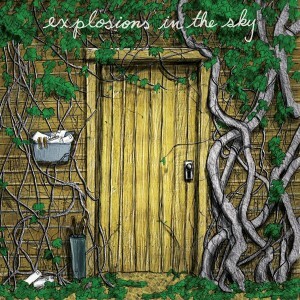 If you aren't familiar with the instrumental post-rock group, Explosions in the Sky, it's about time! Depending on what kind of music you are into, if you are ready to be drifted away passionately through music, Explosions in the Sky is the band to look out for, and their album Take Care, Take Care, Take Care does just that. It's five full-length studio albums into Explosions in the Sky's career, but four years since their last release, All of Sudden I Miss Everyone. The production of Take Care, Take Care, Take Care wasn't an easy one to say the least, being conceived after a bundle of frustration and a month away from music. "A couple years back, we hit a real wall; not much was happening and no feeling was found," guitarist Munaf Rayani tells Exclaim! "So we collectively decided to take a sabbatical. We didn't talk about music or play music. We did everything else. We went to the movies, we had table tennis tournaments -- and we'd have to bite our tongues not to talk about music." It wasn't until a month later that Explosions in the Sky had gone back to their practice space and had started getting down to business. "It's funny how it worked out that way," Rayani says. "But that's art." Record opens up with Last Known Surroundings, majestic as always but they add in a heavy violins which could resemble the time of which the band had not been able to write music, which then guitars break in through the violin's. Once you are two minutes into the song, the real magical melodies come alive and you are completely swept away already by the fourth minute once all of the instruments have combined creating a sound that could do nothing else but make you day dream. All of which keep up with one another till entereing into the second track, Human Qualities, smoothly. Explosions in the Sky's main goal is to get an emotional personal connection with the listeners, breaking the boundaries, past lyrics but just through emotional feels through a track. Human Qualities gives the ability to make you feel both as you hear a voice murmered 2 minutes in, letting you feel just that ounce connected to the track. This track has a very special way of flowing, through billowing shining bright guitars. Finally heavily bringing in the drums through at six minutes and fifty seconds of the song. Trembling Hands offers you something a bit different as it shows more of the rock-side to Explosions in the Sky and has to be one of my personal favorites from the record. The intro carrying you right in with guitar and short vocal looping, giving a very The Appleseed Cast introduction. It is also one of the shortest songs to the records only being three minutes and thirty-one seconds, as the rest are seven to ten minutes long. To be able to listen to this track, click here. "We were excited by the prospect of thinking, 'Can we get away with a three-and-a-half-minute song?'" Rayani stated to Exclaim, remembering the bands process of breaking Trembling Hands down from its original seven minutes. The fourth track of the record being Be Comfortable, Creature, can be explained in one word, beautiful. Beginning with distant tolling bells and E-Bow, leading you throughout softly till bass comes in at two and a half minutes in. The drifting begins, through heavier and heavier instrumental use but just softly enough to keep you in-tune. The last two tracks of the record, Postcard From 1952 and Let Me Back In, are completely two different styles. Postcard from 1952 gives more of a positive vibe, almost as if it would fit perfectly for a summer romance with shimmering guitar tones, and the instruments being able to harmonize both high and low guitars to one another like vocals could, but once again, your emotionally connected. By the end, Postcard from 1952 leaves you sofly but with a bittersweet goodbye. Let Me Back In is a bit more deep and heavy with looping voices, and darker tones. Though, it get's a brighter a minute in and brings you right back into their bright guitars and heavier drums. Reminds me of their former track, It's Natural To Be Afraid, from their album All of a Sudden I Miss Everyone. Overall, Explosions in the Sky ceases to amaze me though people aren't giving them the credit they deserve, stating that the record "could have been better". The way that this band can communicate emotionally through music will forever amaze me, because as a listener, I felt connected to each and everyone of the songs as if they placed me in a whole different world. Take Care, Take Care, Take Care is another one of Explosions in the Sky's brilliant records, and I honestly couldn't of asked for anything better from them. Take Care, Take Care, Take Care will be released April 16th 2011! "The cemetery show was somewhat serendipitous because we were hoping to graduate out of [regular ol' rock clubs]," Rayani says to Exclaim, "We're looking to play more theatres and out-of-the-box venues this year". Keep an eye out to be able to watch their mind-blowing performance in a city near you!